Sure, there are both advantages and disadvantages to earning an online degree. While you sacrifice the social experience of a traditional brick and mortar college—online learning does have many benefits in the cost-savings category. Aside from the obvious higher tuition fees and student housing costs associated with the traditional college experience—with online students are able to earn more money working while they study, save money on textbook rentals, save on typical classroom expenses, student living as well as commuting costs. E-learning works for students who are self-disciplined, driven to succeed organized and able to work to a set schedule. That doesn’t mean it’s a better option compared to a traditional brick and mortar college experience. In the end, it’s really up to you. 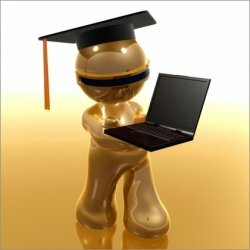 However, we can share the benefits that online learning offers as far as cost savings to help you make up your mind once and for all. 1. You’ll avoid the scheduling conflicts of classroom learning – As you earn a degree online, you have the obvious luxury of working from the comfort of home. Traditional college students typically must adhere to strict class schedules, several times a day without flexibility. However, students who chose e-learning are allotted a huge amount of flexibility as far as setting their own learning schedules. This is ideal for those students who work or care for children during the day time hours and who can’t attend daytime classes. Online learning allows these students to save money by keeping their jobs (or having to hire alternate daycare for their children) and creating a classroom schedule that works for them. Students can schedule their classroom reading, assignments, and the review of lectures during the evening hours if they work during the day. Having the ability to earn money by keeping your full time job—while earning a degree will keep you out of financial debt and save you money in the long run. 2. You don’t need to move - Online students can attend their e-learning courses any time and from anywhere. This means that online students don’t have to quit their jobs, pick up their families and move to the college city of their choice—they can complete their degree from their current city and avoid the costs associated with relocation. 3. You’ll save on commuting costs – With the current state of gas prices that anyone would reconsider commuting to the college of their choice. Student travel has become a big financial burden for those attending brick and mortar colleges. Once you spend all of that money on gas getting to your school—you still have to pay for parking. The commuting costs just never end. Online learning allows you to work from home, which not only saves you transit costs, but also saves you time on studying that would otherwise be wasted traveling to and from your college. Rather than rushing to work to class to home to take care of the kids, students who choose e-learning can spend those hours getting home from work, feeding the kids and then settling down to read their assigned course material from the comfort of their living rooms. By cutting out the commuting costs to and from campus every day, you will radically cut back on gas spending and you can even sleeping in. 4. E-learning will save you classroom material costs – Just think how disappointed Staples and Wal-Mart will be when you don’t enter their stores in September with all of the other students to purchase pencils, pens, paper, notebooks and printer paper. Online students save a lot of money simply because they don’t require as many school materials throughout the school year. How? This electronic style of learning allows students to save on small expenses like printer paper, ink cartridges, photocopying, pens and pencils. And saving money on small things can really add up over the course of a semester—and even a year. 5. You’ll save on textbooks – The final, and probably the biggest, cost savings for online students is textbook costs. Most textbooks and reading materials that are assigned to students enrolled in an e-learning course are free. Paper textbooks cost outrageous amounts of money. And most of the time, they come in “bundles” with CDs and lab notes that you don’t even end up using. If you do end up needing a physical textbook referral, you can always rent textbooks online—this way you are only borrowing what you need. Cutting the cost of paper textbooks helps online students see huge savings. And in addition, they don’t need to scramble to get their money back by trying to sell the used textbooks at the end of the year.